The Shofar is a ram’s horn used by Jews, beginning in ancient times, in religious and civic ceremonies, and is now sounded at Rosh Hashanah and Yom Kippur, two of the most important holy days for Jews. It functions as a call to action, to take our understanding and our relationships out into the world and to make it better. In Jewish tradition, this is called Tikkun Olam, repair the world. Five times a day the call to prayer is chanted before each prayer. Followers of the Islamic faith, all over the world, stop what they are doing and pray. The call to prayer is like an alarm clock for most devout Muslims. It notifies the believers that the time for prayer has commenced and to get ready for the prayer. With each prayer, they show their devotion to God, most often called by the Arabic name, Allah. The world Islam means “surrender to God,” and followers of this faith (known as Muslims) are required to submit to God’s will. The religion’s holy book, the Qur’an, contains the word of Allah, as told by the angel Gabriel to Islam’s Prophet and Messenger Muhammad. Hinduism is one of the world’s oldest living religions. It is a rich collection of hundreds of spiritual and philosophical traditions followed throughout Asia for more than 5,000 years. Most traditions within Hinduism share certain distinctive core beliefs, despite the absence of an identifiable beginning in history, a single founder, a central religious establishment or a sole authoritative scripture. The concept of Pluralism is expressed through the diversity of Hindu practice and centuries of peaceful co-existence with various faiths. Hindus blow the conch shell during worship at home and at the temple, or to mark an important occasion. When the conch shell is blown, the primordial sound “Om” is produced, which is considered to represent the Universe and the Truth behind it. The Christian faith is an Abrahamic, monotheistic religion based on the life and teachings of Jesus of Nazareth. Christians believe that Jesus is the Son of God and the Savior of humanity whose coming as the Messiah (the Christ) was prophesied in the Hebrew scriptures. Christianity teaches a way of life that reflects the life of Jesus and emphasizes grace, forgiveness, love, and obedience to God’s will for redeeming all Creation. Today Christianity is found in most parts of the world and is thought to be the largest religion. Zoroastrianism is considered to be one of the oldest monotheistic religions in the world, having originated in Persia or modern day Iran over 3000 years ago. Its founder Prophet Zarathustra or Zoroaster taught belief in one God – Ahura Mazda. His teachings are contained in the divine songs called Gathas. A dominant religion of the civilized world from 500 BC to 500 AD, Zoroastrianism influenced many other faiths that originated in the Middle East with concepts of Heaven and Hell, the coming of a Savior and the final Day of Judgment. The religion also preaches non-violence, religious tolerance and philanthropy. By practicing the principles of Good Thoughts, Good Words, and Good Deeds, Zoroastrians work to create a heaven on earth filled with peace and prosperity. The Amma Center of Michigan in Ann Arbor is part of a worldwide interfaith community. The center is inspired by Mata Amritanandamayi, known as Amma, an internationally renowned spiritual teacher and humanitarian. Amma has blessed, through her motherly embrace, 35 million people around the globe, from every faith tradition and walk of life. She encourages each individual to follow their own faith and live according to the deep values shared by all religions. Amma is a beacon of selfless service and the local center aspires to follow this example in all their actions. Through a multitude of charitable projects the center aims to reach out to those in need. Amma also encourages the importance of caring for Mother Earth. Amma’s youth groups called AYUDH are in several countries across the world. The intention is to help each young person grow in their personal development and to create, through active and fun programs, a desire in them to make a positive difference in the world. AYUDH is a Sanskrit term meaning peace and also is an acronym for Amma’s Youth for Unity, Diversity and Humanity. The Baha’i faith began in modern Persia (modern Iran) in 1844. Its Prophet-Founder was Baha’u’llah, a name meaning “Glory of God.” Baha’is believe in the unity of humankind and accept the great world religions and their prophets. Some of their beliefs are the Oneness of God, the essential harmony of science and religion, the elimination of prejudices of all kinds, equality of men and women, a spiritual solution to economic problems, universal compulsory education, and independent investigation of the truth. Although there are no clergy, there is a governing body called the Universal House of Justice in Haifa, Israel, which has a board of nine members, voted on by Baha’is all over the world. The central purpose of all Baha’is is to bring forth an ever-advancing civilization, as written in their holy books by the founder of their faith. The Church of Jesus Christ of Latter-day Saints believes the family is divine in nature and God has designed it as the fundamental building block of all community, both on earth and through eternity. Through following Christ’s teachings, Latter-day Saints believe all people can become “partakers of the divine nature,” and that human beings are created in the image of God. Each is a beloved spirit son or daughter of heavenly parents, and, as such, each has a divine nature and destiny. They also believe that happiness in family life is most likely to be achieved when founded upon the teachings of Jesus Christ. Successful marriages and families are established and maintained on principles of faith, prayer, repentance, forgiveness, respect, love, compassion, work, and wholesome recreational activities. Jainism is one of the oldest living religions of India, predating recorded history as referenced in Hindu scriptures. It is an original system quite distinct and independent from all other Indian philosophies. Jains believe in the philosophy of Karma, the reincarnation of worldly soul, Hell and Heaven as a punishment or reward for one’s deeds, and liberation (Nirvan or Mokshu) of the self from life’s misery of birth and death in a way similar to the Hindu and Buddhist beliefs. Though there are similarities in these South Asian religions, there are some major portions of the belief system that remain unique to each religion. Song and Spirit brings people of different faith traditions together to engage in creative service through education, music, art and social outreach programs. 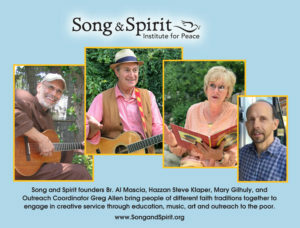 Hazzan Steve Klaper, Mary Gilhuly, and Brother Al Mascia OFM serve up tasty weekend retreats, missions and Shabbatons that engage the entire community in spiritually uplifting explorations of music, study, art and faith. Greg Allen drives the Care-A-Van and delivers the CarePax to the homeless in Detroit. Come and take somebody’s hand, sing along. The choice is ours – what will we do? It’s up to me. It’s up to you. We are children of justice. We are children of love. We are children of music. We don’t want war anymore. Each moment in peace eternally. Please join us at the Afterglow downstairs in the Hospitality Room. The Next World Sabbath will be held on Sunday, March 1st from 4:00 PM to 6:00 PM at North Congregational Church, 36520 W. 12 Mile Rd., Farmington Hills, MI 48331. Mark your calendars! !